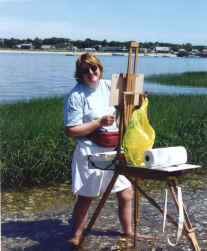 Recently retired from teaching fine and computer art in NJ at Ramsey High School, Elaine is enjoying the quieter months of the Cape to paint. She went to William Paterson College as a fine arts major and worked for several newspapers after graduation, designing display ads and promotional materials. After marriage and children she did freelance work and returned to oil painting with a wonderful teacher named Louis Sala. She studied in Provincetown with Lois Griffel from the Cape Cod School of Art from 1998 to 2002 which made a huge difference in her color palette. Coming up to the Cape for many years, the Lobays “washed ashore” in 2016.